Removing these contaminants is critical to a uniform Babbitt bond. 2. Once the surface is clean and oil-free, the surface is typically “tinned” using either the same #2 Babbitt that forms the bearing surface, or a premixed Tin-Flux compound like KappaTinning™ Compound. In using the same #2 Babbitt wire, the surface is prepared using a chemical flux, heat is applied to the part (not the solder) and the wire is applied as evenly as possible. Then, the surface is LIGHTLY hand wire brushed to check the uniformity and bonding of the tinned surface. Any areas of imperfection or poor bonding are typically re-tinned using the same procedure. A pre-tinning compound like KappaTinning™ Compound contains a powder or crystalline flux and pure Tin powder. 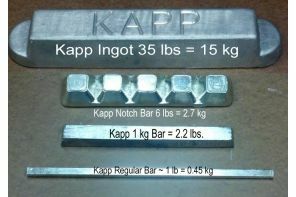 For example, our KappaTinning™ Compound is 50% Flux / 50% High Purity Tin. Remember that the main purpose of this tinning is to ensure a uniform bond between the Babbitt and the Steel bearing shell. Thus, even with pre-tinning compounds, the surface is still hand wire brushed to check the uniformity and bonding of the tinned surface. Any areas of imperfection or poor bonding are typically re-tinned using the same procedure. 3. Once the bearing shell surface is prepared, the Babbitt surface layer is poured, laid down as a bead with automatic soldering equipment, or sprayed onto the tinned surface using a spraywire system. 4. The final surface is prepared to specification. The process involved in this step depends greatly on the process in step 3. The bearing may require machine turning out, grinding and/or polishing to meet the final specifications. Always grind opposite to rotation and polish in the direction of rotation. Engineering characteristics for common Babbitt alloys are shown below. In the rebuilding and repairing of engine, motor, generator, and rolling mill bearings, the first step is always to determine why the bearing surface failed. This will allow you to design a maintenance program going forward to avoid or minimize the chances of similar failure. Please review the article on “Babbitt Bearing Failure Analysis” to learn more about the causes of bearing failure and how to avoid them.